Weather permitting! Os ydy’r tywydd yn iawn! 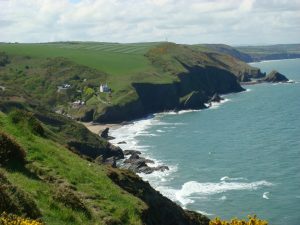 The newly-formed Plastic Free Llangrannog group held a meeting on 22 March in Pontgarreg Village Hall. Attendees included Beverley Hodgett from Ceredigion County Council’s Waste Management Team, Gwyn James our local councillor and Ben Lake, our MP. The event was chaired by Helena Boyesen and saw representatives from Business Wales, Gwersyll yr Urdd, Llangrannog Welfare Committee, Llangrannog Boating and Angling Association, local farms and the Beach Hut Cafe, among others. Items discussed included a recycling station for the beachfront, bins needed for the boatyard, details of the current Council processes, how to deal with holiday home waste, dog waste and dogs on the beach, taking plastic out of the system at a higher level, information for residents and visitors, water bottle refill/water fountain stations for the village, how to reward people who are doing good things in this area, organising a local co-operative or hub for buying materials and the new Council proposals for waste collection. If you would like more information, check out the Facebook page.